Yesterday I fertilized all my garden plants in the front yard with Alaskan Fish Fertilizer. That stuff is very stinky, draws flies and my hands and feet always get a soaking while I'm applying it! The things we do to have an organic garden! ;^ } While passing by my blue and gold macaw, Libby, with my smelly self, I stopped to say hi. She literally turned her head and body away from me because I smelled so horrid! I'm working on thinning out the peaches on our peach tree. 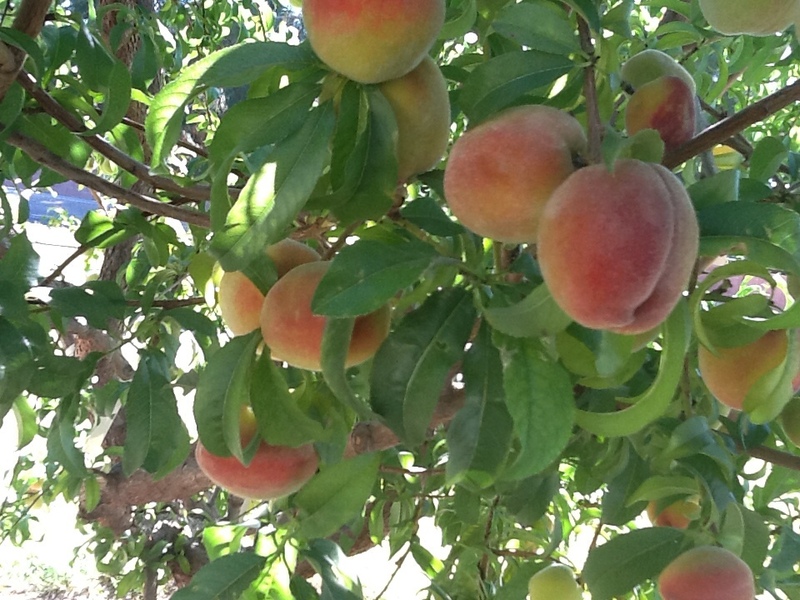 Peach trees are such work horses, they always produce more fruit than the tree can physically bear. If you don't remove at least half of the fruit, you risk the limbs breaking and literally destroying the tree! Our peach tree has been grafted with 5 different types of peaches and will keep us in peaches from the end of April through the first of July! The early peaches are just about ready to eat. I sampled the first of the season yesterday. It was sweet and juicy! Time to cover the early peach branches so we don't have to share with all the neighborhood birds! I use old wedding tule draped over the branches to keep the peaches from being taste-tested! 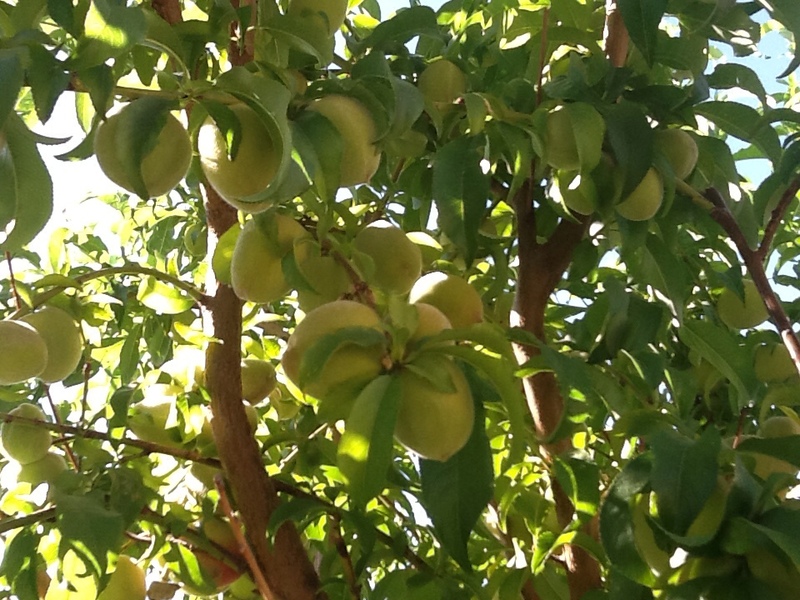 I'll need my ladder to thin these peaches in the upper branches. 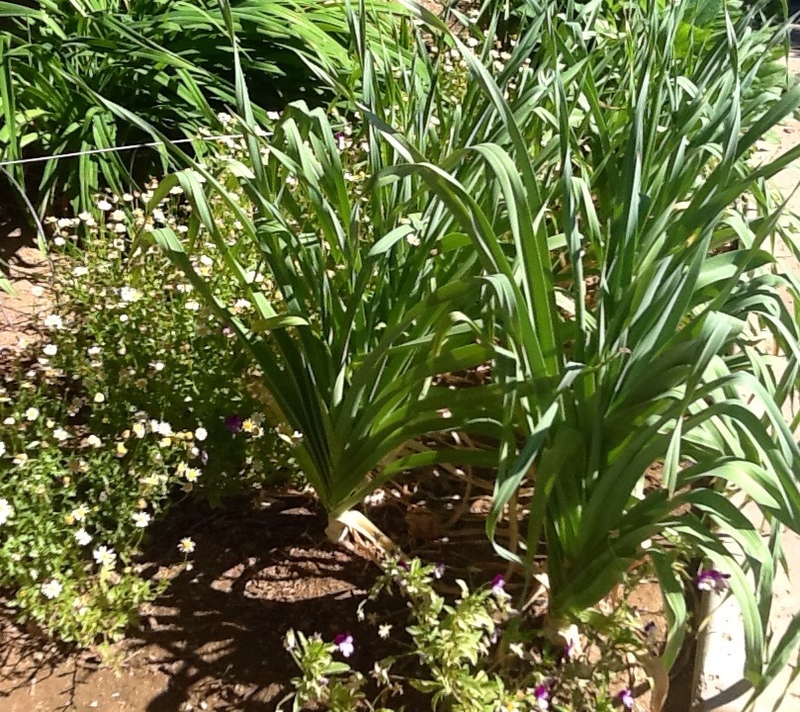 HERBS- I presently am growing Italian parsley, dill, oregano, thyme, sage, marjoram, lavender, bay laurel, stevia, basil, catnip, onion and garlic chives. 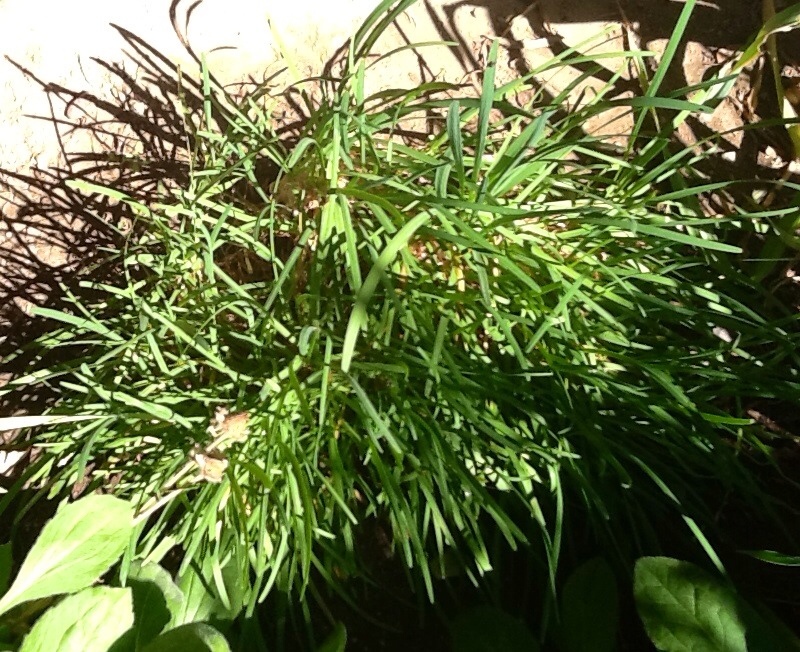 Garlic Chives . . . Great in salad dressings, soups, dips and potatoes. 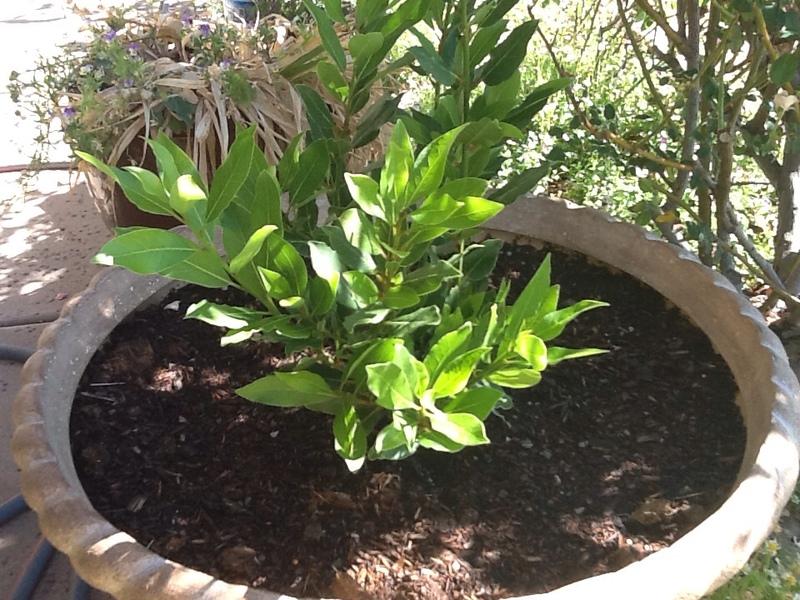 My highly prized and long awaited Sweet Bay Laurel used in soups, stews, corned beef, boiled shrimp etc. I've found that most of my herbs grow best in large pots. 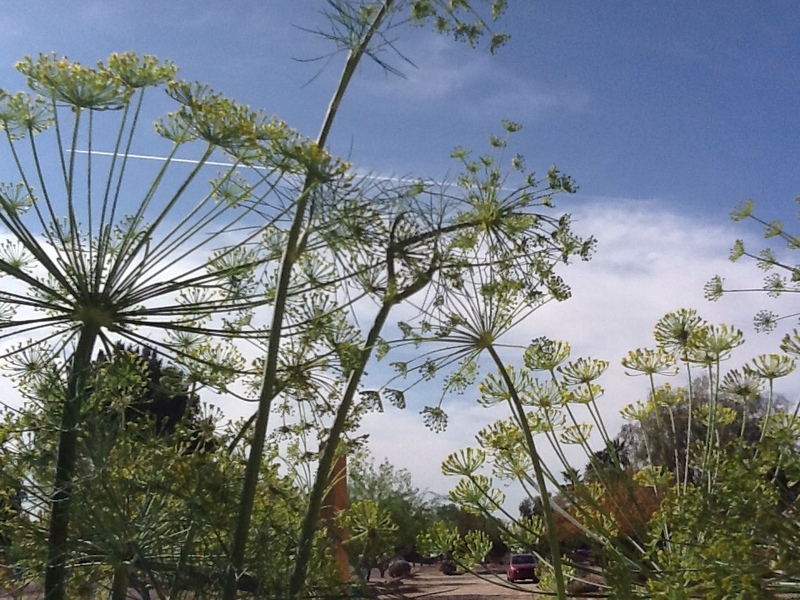 The roots get too wet when planted in the ground because we irrigate our property. 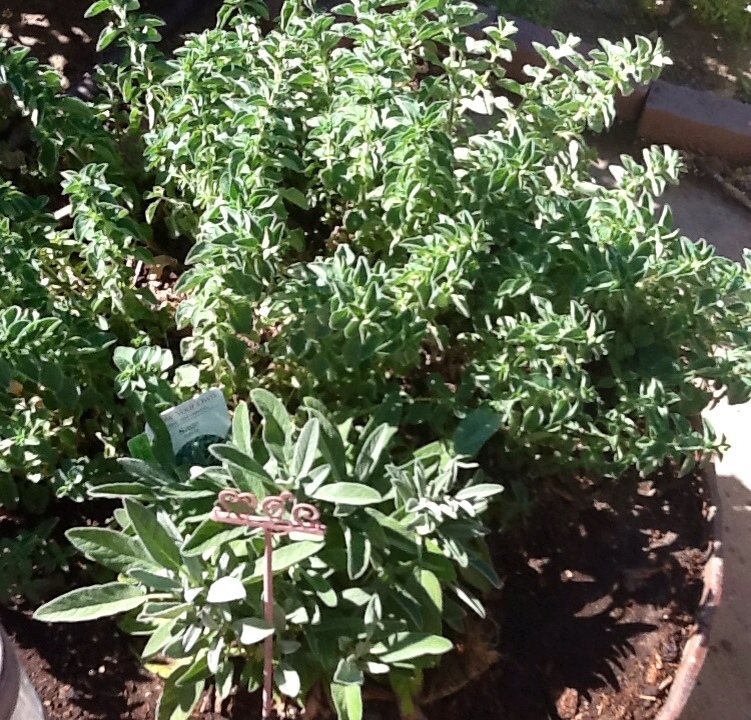 Oregano and Sage . . . 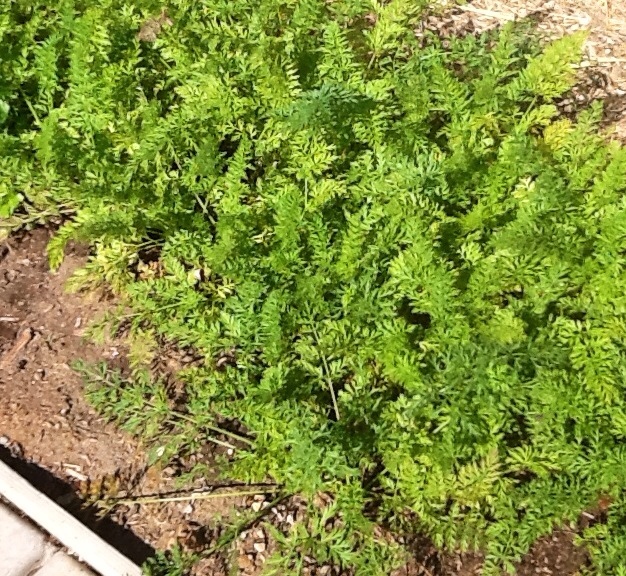 It's wonderful having fresh, organic herbs for cooking. Dill . . . I use it for pickles, Homemade Potato Salad, Creamy Ranch Dressing, and on grilled salmon. Carrots . . . Great fresh, in salads, coleslaw, and roasted. 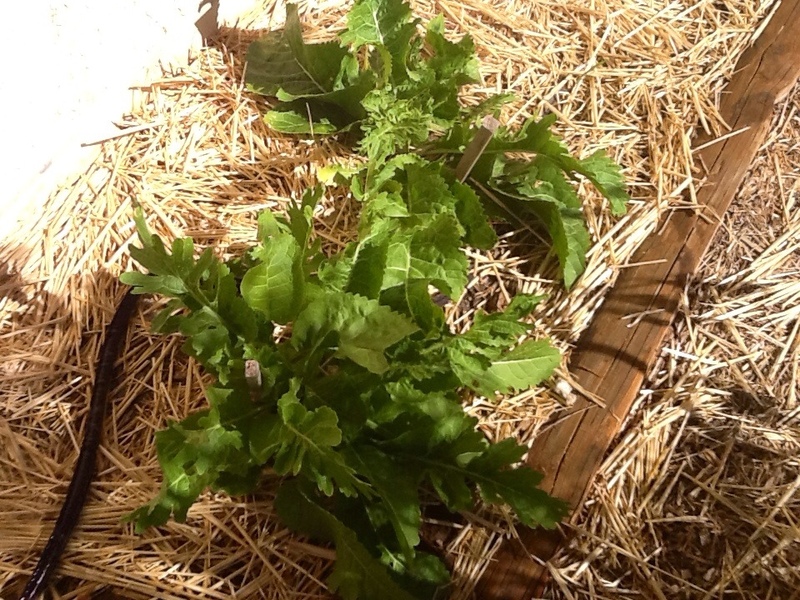 Horseradish . . . I'm growing it in buckets with holes drilled in them to keep the roots from taking over the garden. These will be used to make fresh grated horseradish for use in homemade mustard, Messy Janes, cocktail sauce, and as an accompaniment for ham and prime rib. 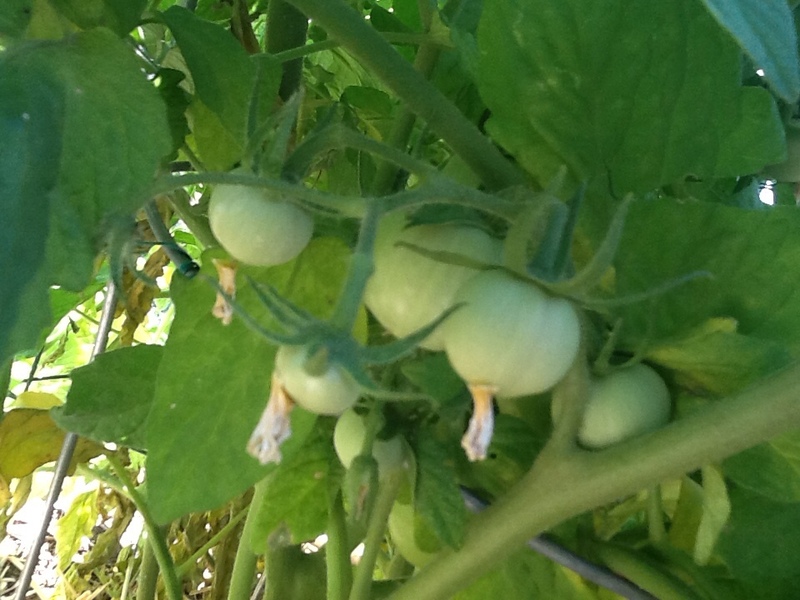 Early Girl Tomatoes do well in Arizona. Blackberries . 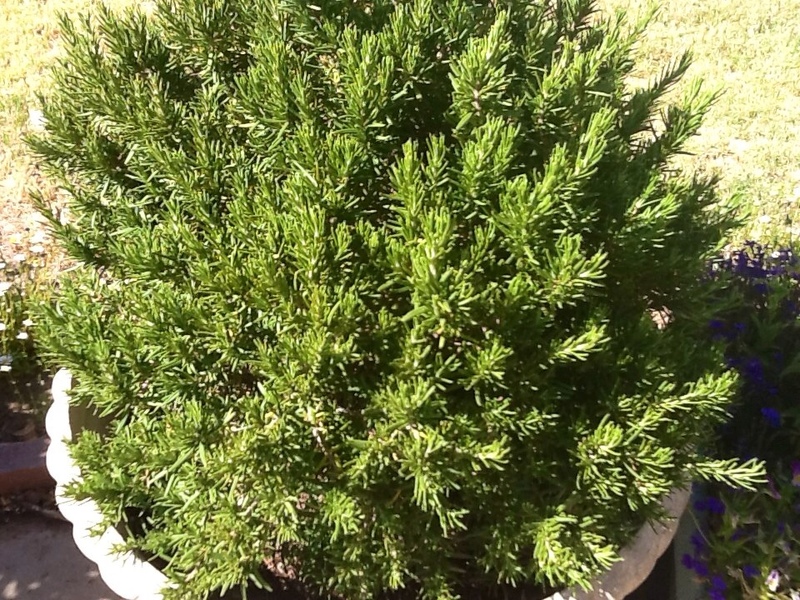 . . My original 2 plants were given to me by Jerry Fleming, probably 12 years ago. We grow the berries on three wires suspended between poles in a 12 foot row. 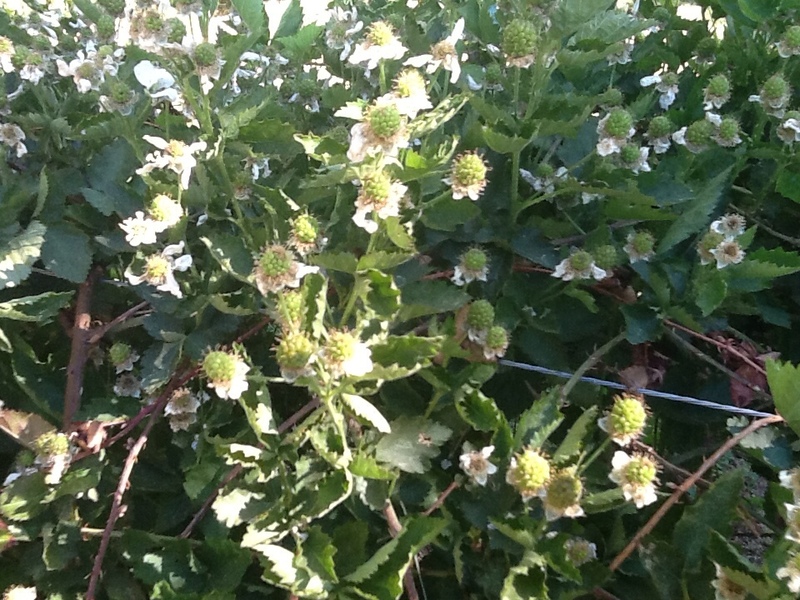 Most of our neighbors have started their own berry patch from all the new plants that pop up in our yard. I make blackberry jam, cobbler, syrup, sorbet, and freeze berries for ice cream and Easy Crock Pot Yogurt, oh, and pie! This year I'm hoping to find a recipe for blackberry barbeque sauce. This is our first year growing potatoes. It's time to hill our spuds so they produce lots of yummy potatoes. We've staked an 18-inch fence around the raised bed to hold in the straw. This weekend we'll buy another bale of straw and complete the hilling. 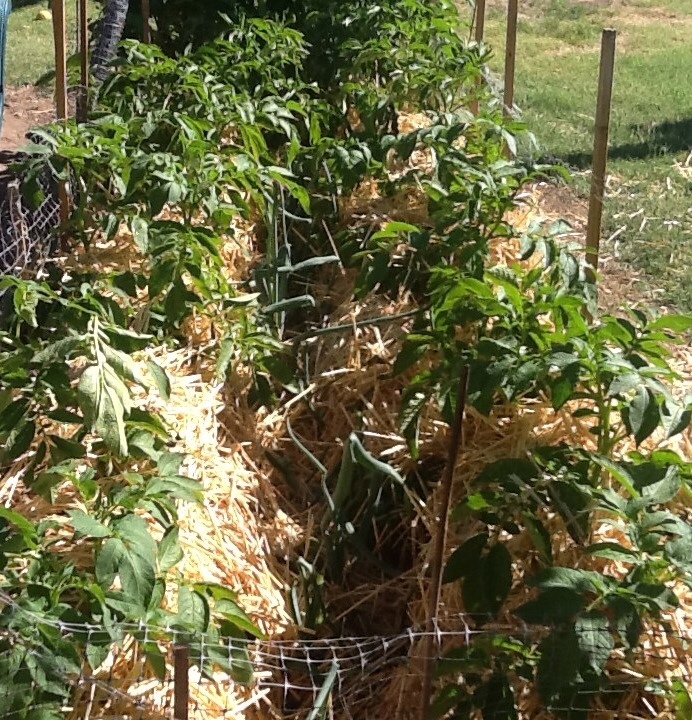 We chose straw because it makes harvesting cleaner and more practical with raised beds. We'll boil huge pots of potatoes and roast large heads of garlic from our garden to make Garlic Mashed Potatoes (recipe coming soon!). I love having several quart bags of frozen garlic mashed potatoes safely tucked in the freezer to pull out at a moments notice! Leeks . . . Potato Leek Soup, Chicken Breasts on a Bed of Leeks sautéed in butter and white wine, it makes me swoon just thinking about it! Left foreground- lilies, butterfly iris, roses. Left background- dwarf kale, Swiss chard, beets, rhubarb, wax beans (just planted), boysenberries, Anaheim chili pepper, brown onions, garlic, red sweet peppers, and hollyhocks. Right foreground- more yellow beans (just planted), Yukon Golds, Early Girls, Roma tomatoes. Far background, blackberries, lemon tree and rest of the citrus orchard. We also put in asparagus roots this spring, so we are looking forward to our first harvest next spring. To the right of the asparagus is a small patch of sweet corn, and to the left, a yellow pear tomato, cherry tomato and a couple of Roma plum tomato plants for making marinara sauce. I still need to get in some yellow squash and zucchini for eating fresh and making my famous canned Kick-n-It Relish! In a couple weeks the canning and freezing will begin! If this is a skill you want to learn, I'll do my best to help you get started. Because I live in a place with three growing seasons I don't have to preserve as much as ones who combat the cold. 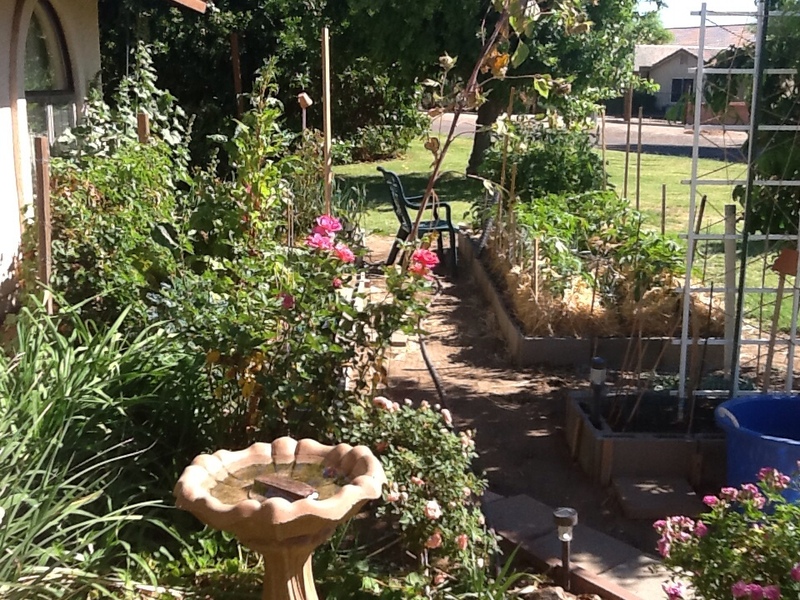 I have seasonal fruit and veggies fresh from the garden 10 out of 12 months! To all of you dear friends who visit regularly from the US of A a big, heartfelt Arizona- Howdy! A special hello to all my friends visiting this blog from Canada, Germany, France, Australia, South Africa, Argentina (I have visited your beautiful country twice), Russia, Spain, Greece, Croatia, Vietnam, United Kingdom(I have visited your wonderful country also), Sweden, Norway, China, Iraq, Malaysia, Philippines, Japan, Columbia, Singapore, India, Ukraine, Aruba! Serbia, Georgia and last but not least, Slovenia! I am deeply touched by your visits to Over at Julie's and I'd love to get to know you! Thank you so much for dropping by . . . Over at Julie's!! !